Get an Awning Before the Rain Season Comes! Spring is upon us and as much as we would love to think it is time for sunshine- it is really time for sunshine and rainbows, because it will rain a lot. Spring time is time for flowers to bloom and this means they need a lot of rain to grow big and tall. This also means that while the weather is nice outside you will be stuck inside. If you thought you had cabin fever during the winter imagine what it will be like seeing all the snow melted but still having to stay inside. We have the perfect solution for you, an outdoor awning. This would make it possible for you to be outside and enjoy the smells of the season without getting wet. Spring showers are the best time to get outside and smell the fresh rain and feel the warmth on your skin. Some awning setups can even have walls that come down so you can be protected from the rain coming in at a sideways angle. 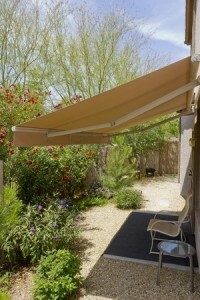 Awnings are also great to protect your outdoor furniture and patio space. When extended; an awning will protect whatever is underneath it. This means your new chair and table set. You will be protected from not only from the rain and some wind; but also from the harmful rays of the sun. The sun can very easily and very quickly fade the fabric of many outdoor chairs. If you are going to invest in your patio and the things you keep on it, you also should invest in an awning that will protect all these things you have worked so hard for.